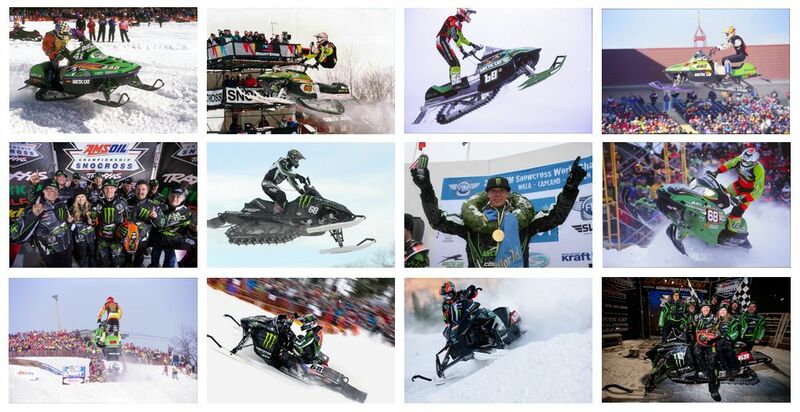 For more than 20 years Tucker Hibbert has given snocross fans a stunning array of accomplishments and entertainment, many of which were defining moments of the sport. 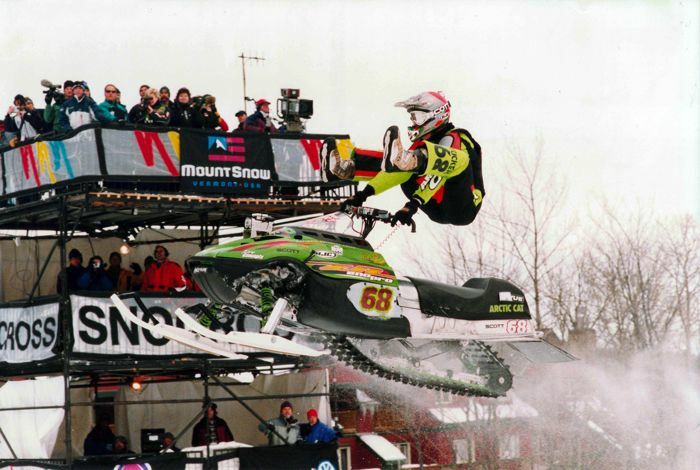 Tucker’s first-ever snocross race occurred in West Yellowstone, Montana, in 1996. Eleven years old at the time, he borrowed his dad Kirk’s jacket, helmet, snowmobile and talent for winning, taking first place in the Junior class. In hindsight, it would prove to be a strong hint of what was to come. Photo by ArcticInsider.com. 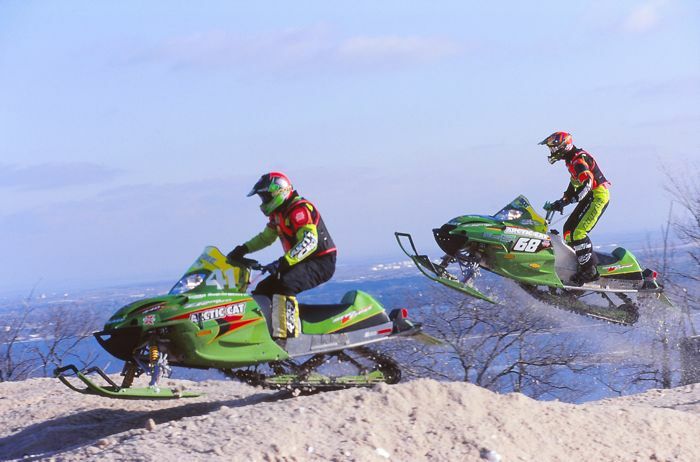 When Tucker Hibbert captured the gold medal in snocross at the 2000 ESPN Winter X Games as a 15-year-old Semi-Pro racing against the sport’s established professionals, it turned him into an instant icon in the snowmobile world and in action sports. 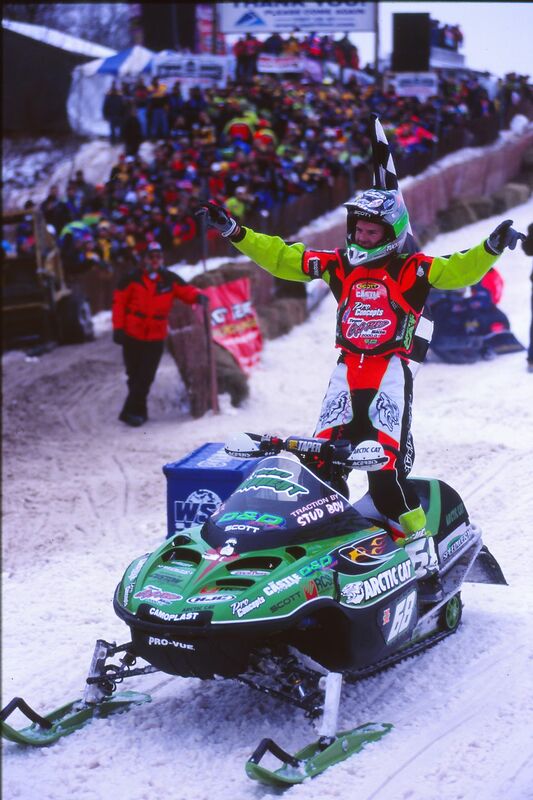 It also established his successful and unique relationship with the event, where he would eventually capture nine more gold medals, three silver and one bronze, making him one of the all-time most decorated X Games athletes as well as one of the most recognized snowmobile racers in the world. Photo by: Pierre Catellier. 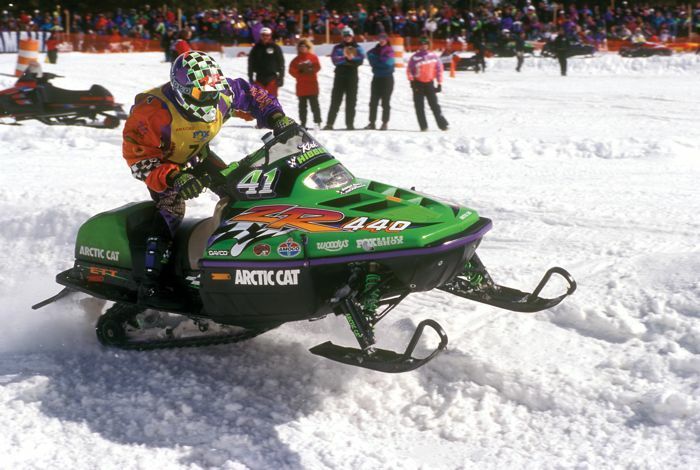 When Tucker first became serious about racing snocross in 1998, the Hibbert family turned to their friend Russ Ebert to be his mechanic and crew chief. One of the sport’s finest engineers and strategic thinkers, Ebert proved to be the perfect match to Tucker through the 2003 season, after which Kirk Hibbert retired from competition and became Tucker’s mechanic. Photo by ArcticInsider.com. After two years racing as a top Semi-Pro, Tucker turned pro for the 2000-2001 season. 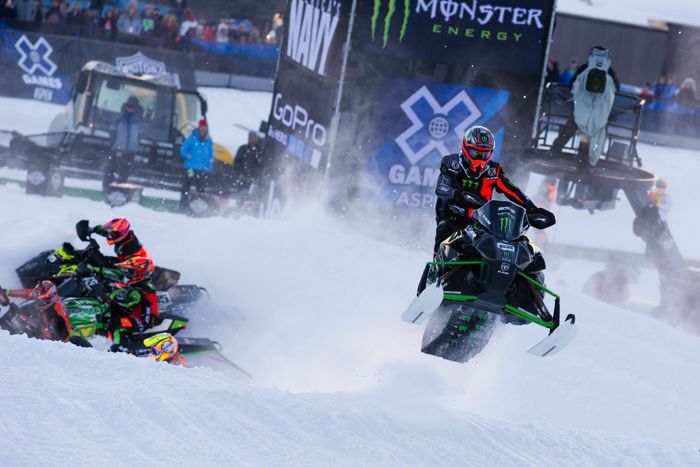 Although he had won gold in snocross at the X Games the previous season, there were still questions whether he was ready to battle for wins in the Pro class. At the season opener in Duluth, Minn., 16-year-old Tucker shrugged off having to come through the Pro Open LCQ and starting on the back row, delivering a dramatic come-from-behind victory that erased any doubts about his ability and his resolve. The win (and the way in which he earned it) proved to be another emphatic signal of what was to come for the next 18 years. Photo by ArcticInsider.com. 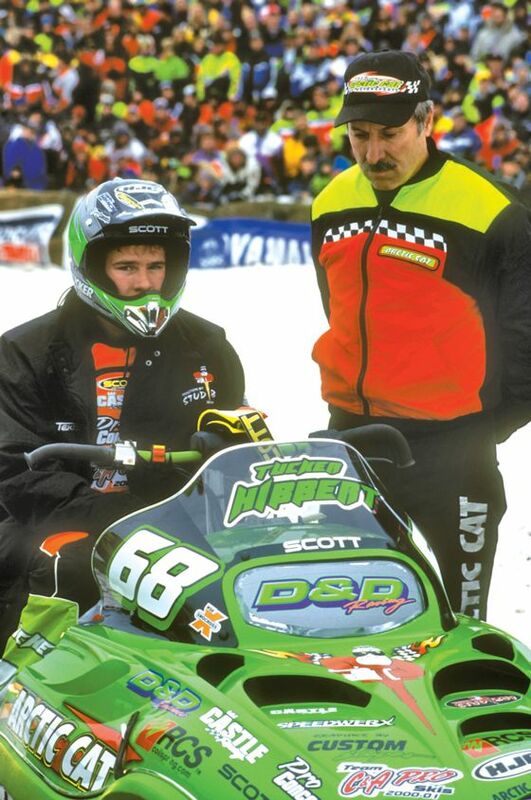 Tucker’s dad, Kirk (left) was one of the all-time great snowmobile racers, with a Hall of Fame career in snocross, cross-country and hillclimb competition. The two enjoyed a few overlap years when they competed with and against each other, as they are here with Kirk leading Tucker at the Spirit National in Duluth, Minn., in 2001. Photo by ArcticInsider.com. Tucker Hibbert captured his 50th Pro National win in just his 100th career start. It occurred in 2009, at the Milwaukee Mile racetrack near Milwaukee, Wis., in his ninth year as a professional. Tucker himself never focused on breaking records, rather his goal was to try to win every time he was on the track, whether it was a heat race or final event. Photo by: John Hanson. The team poses after Tucker scored his 50th career Pro National victory, in Milwaukee, Wis., in 2009. From left to right: Robby Dahlen, Paul Engelstad, Tucker Hibbert (seated), Mandi Hibbert, Steve Houle, Kirk Hibbert, Mike Kloety, Roger Skime. Photo by: John Hanson. 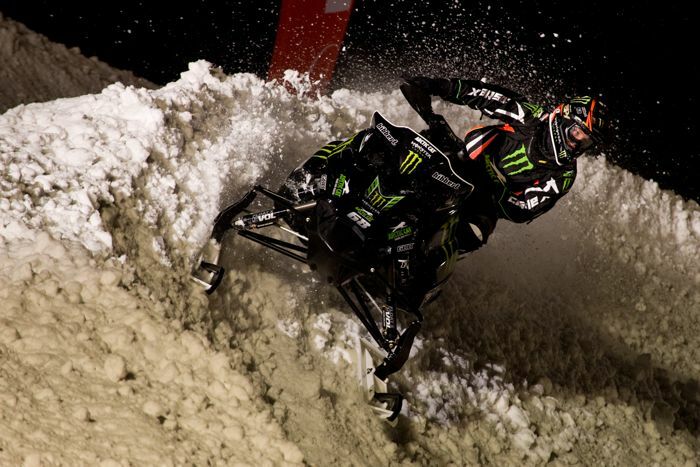 For the first time in his career, Tucker Hibbert ventured off North American soil to compete at the 2010 FIM Snocross World Championships in Mala, Sweden. Massive crowds, an excellent racetrack and a large contingent of European racers welcomed him. He delivered on the promise of his reputation, winning the race to be crowned World Champion. Photo by: Joni Launonen. 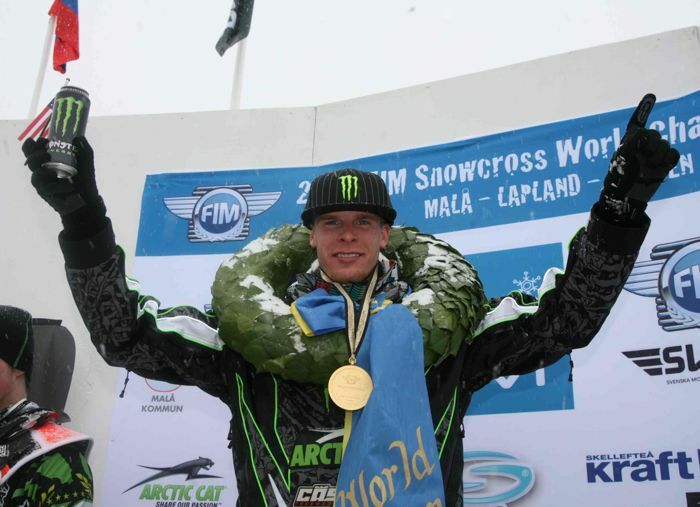 On the victory podium at the 2010 FIM Snocross World Championships in Mala, Sweden. 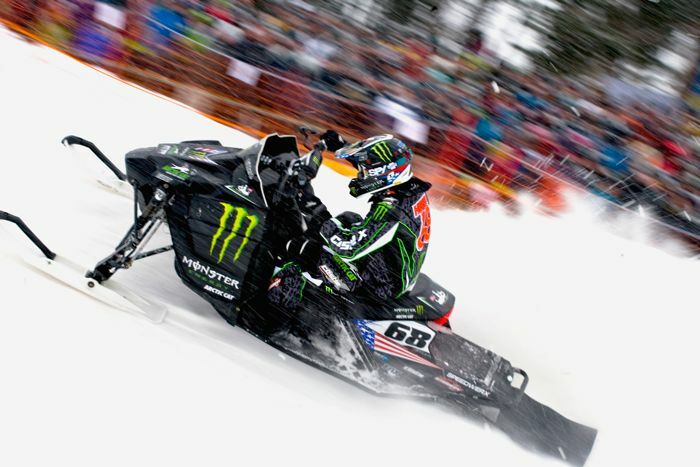 Hibbert returned to overseas competition to contest and win the 2012 FIM Snocross World Championships in Semigorje, Russia, as well as the 2013 Clash of Nations in Falun, Sweden. Photo by: Joni Launonen. 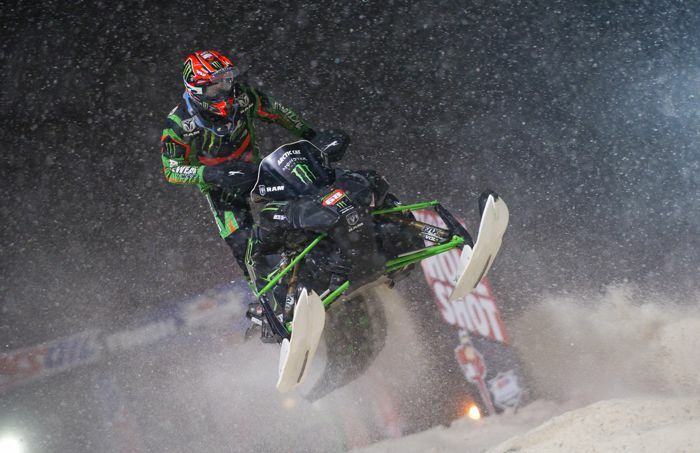 Already the all-time leader in Pro snocross wins, Tucker Hibbert began the 2015 season with a shot at taking his 100th career Pro win early in the season. He came up short of notching the big win at events in Fargo, North Dakota, and Canterbury Park in Shakopee, Minn., and brought a fiery determination to the fourth round in Deadwood, South Dakota. When he suffered a crash in the first turn on the opening lap of the Deadwood final, the 100th win again looked out of reach. But then Tucker delivered what many consider one of the all-time great come-from-behind charges, going from last to first in 22 laps to take the win and set another record. Photo by: John Hanson. 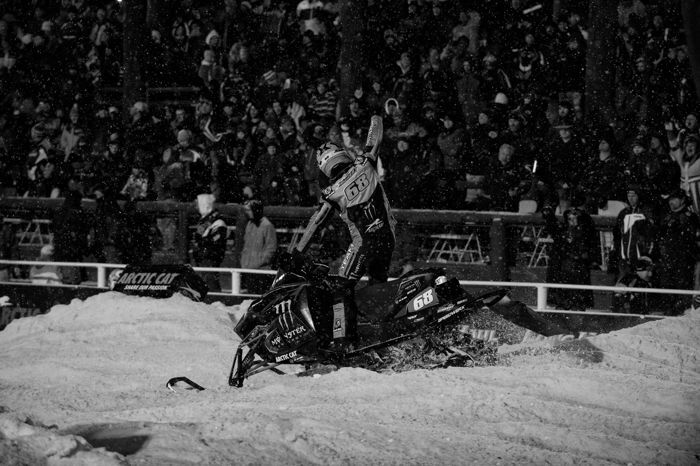 In 2015, a stadium packed with race fans in Deadwood, South Dakota, cheered one of the most dramatic races in snocross history when Tucker went from crashed (and last) to first. Photo by: John Hanson. Having just witnessed Tucker’s historic charge from last-to-first to score his 100th career win in Deadwood, South Dakota, in 2015, the team was astonished and thrilled. From left to right: Robby Dahlen, Kirk Hibbert, Tucker (seated), Kevin Krocak, Mandi Hibbert (seated), Garth Kaufman and Steve Houle. Photo by: John Hanson. 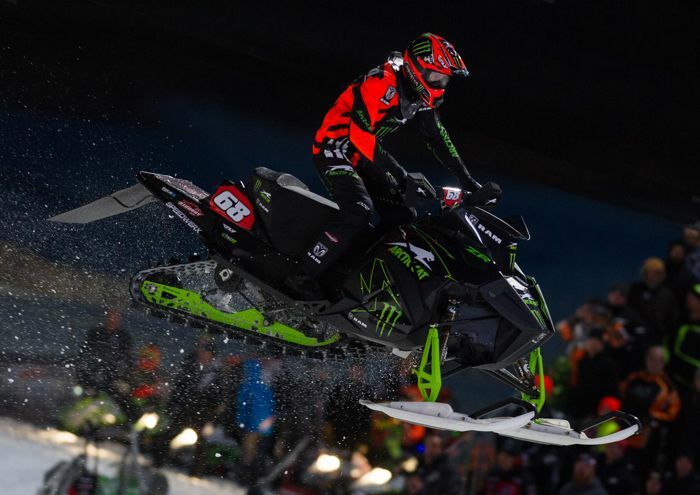 Throughout his career Tucker Hibbert made the X Games snocross race a primary focus, building a special sled for each event, spending weeks practicing at high elevation on specially constructed courses, and leaving no detail to chance. The results reflected the effort. This photo is from 2016, when he captured his ninth straight gold medal (and the 10th of his career) in Aspen, Colo. Photo by: John Hanson. 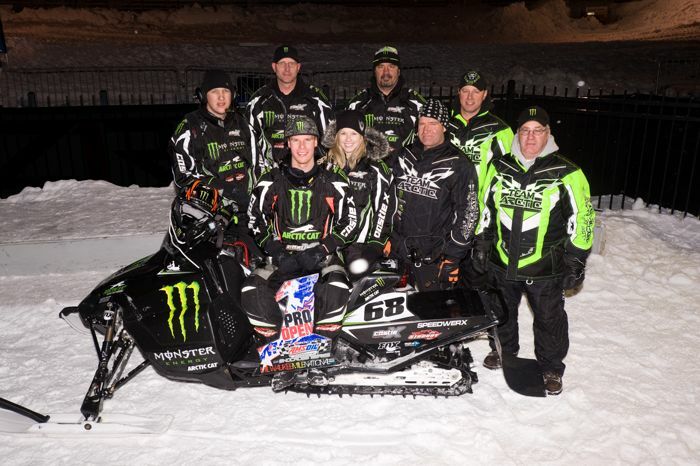 Team 68 celebrate Tucker’s gold medal nine-peat at the 2016 X Games in Aspen, Colo. From left to right: Steve Houle, Mandi Hibbert, Tucker Hibbert, Kevin Krocak, Kirk Hibbert, Dan Ebert, Robby Dahlen. Photo by: John Hanson. Hibbert earned his 11th Pro National Championship title in 2018 following a dominant season in which he won 11 finals. He’s shown here at the season finale in Lake Geneva, Wis., where he sewed up the championship title on the second of three race days. Photo by: John Hanson. 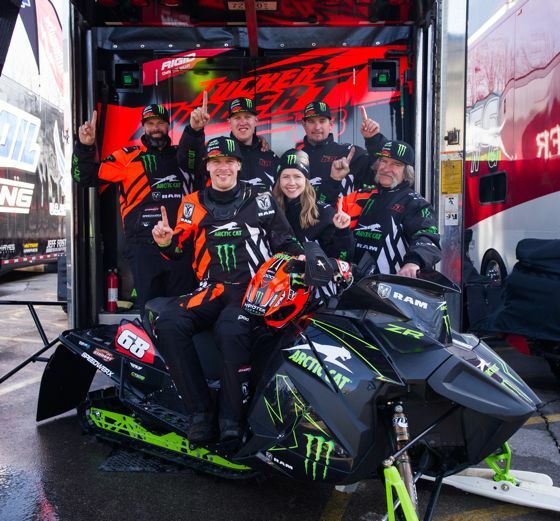 Team 68 takes a moment to enjoy winning the 2018 ISOC Pro Championship points title at Lake Geneva, Wis., the 11th of Tucker Hibbert’s career. 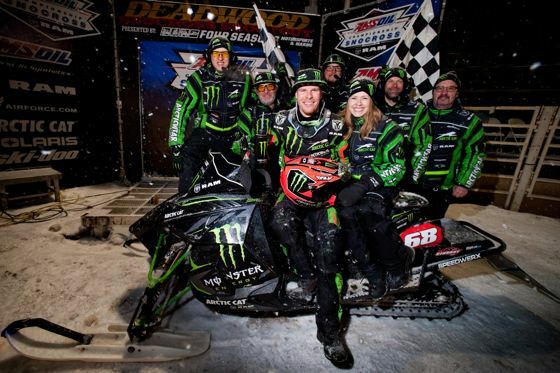 From left to right: Garth Kaufman, Tucker Hibbert (seated) Robby Dahlen, Mandi Hibbert, Kevin Krocak, Kirk Hibbert. Photo by: John Hanson. After watching Kirk race back in the day, I knew Tucker would be great. Tucker proved over and over again that he had what it takes to be a TRUE CHAMPION of the sport. The teams overall dedication is what made Tucker an awesome driver. He will be truly missed next season. Congrats on your retirement and good luck no matter what you do Tucker. Go race on the Pro AM 30+ class now LOL. It's time for Tucker and Mandi to generate the next champion. Boy or girl. Either way good luck on what ever you guys pursue. You deserve it. Congratulations again! Bittersweet.... Feels like the end of the golden years of snocross. Glad I got witness all of this guy’s career. WOW! What a fantastic career! Just putting the numbers together.... Tucker retires at the age(33) I started watching/following him race. Epic battles between Tucker and Blair... Then Ross Martin, Tremblay and Kamm.... He's shown his tail light to a lot of talented racers over the years. The number of career wins rivals the likes of Richard Petty in NASCAR! Congratulations on your career achievements and retirement!